Whether your recipient is walking down the aisle or remembering a lost loved one, this arrangement is sure to find a special place in their heart. 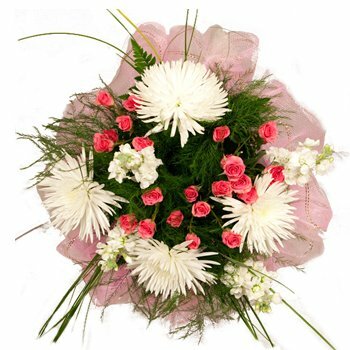 Tiny, delicate bright pink roses burst into bloom amid dazzling white spider mums and the whole bouquet is arranged atop gorgeous verdant greenery and adorned with pale pink ribbons. Send your sympathies or send your love with the Love's Journey Bouquet.